Baptism is one of the most significant parts of our worship. We baptize both adults and children. In both types of baptism, God is at work in the lives of the one being baptized. When an adult is baptized, they are making a profession of faith claiming that Jesus Christ is Lord and Savior of their life. Baptism is just the beginning of a person’s faith journey. First Presbyterian Church walks alongside people who make this significant step in their life by helping them grow as followers of Christ. 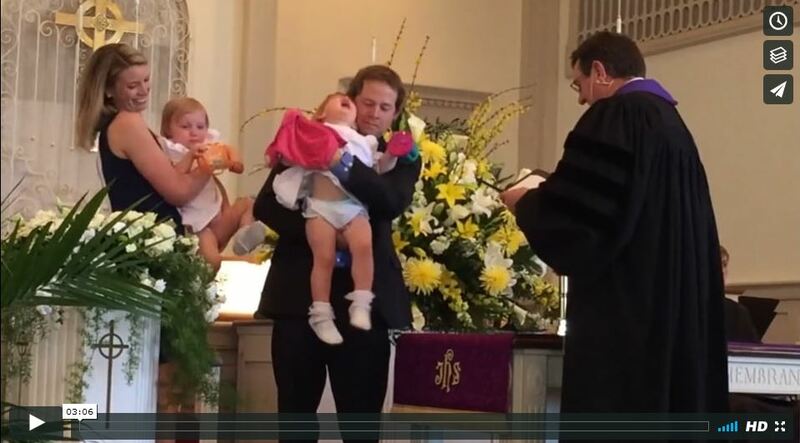 When a child is baptized, the parents make a profession of faith on behalf of their child. As the parents claim that Jesus is their Lord and Savior, they also make commitments to raise their child to know Jesus Christ. In baptism, a child becomes a part of the church family but they must one day make their own decision to follow Jesus Christ. This decision often takes place in the elementary or middle school years. Many of our children confirm their parents desire when they go through the confirmation process, usually in their 8th grade year. First Presbyterian Church walks alongside families as they teach their children about faith and a relationship with Jesus Christ. We also provides age appropriate and dynamic programs for children and youth as well as small group leaders who mentor young people as they grow in their faith. For questions, more information or to schedule a baptism, please contact Kathleen Wilder, 843.448.4496. Just for fun, here is our most memorable baptism to date at FPC!